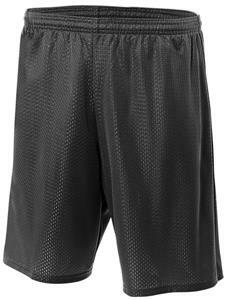 A4 Youth Lined Tricot Mesh Basketball Shorts. 100% Polyester 70 Denier Tricot Mesh. 100% Solid Polyester Tricot Liner. Moisture Wicking. Odor Resistant. Stain Release. 1.5" Cover Elastic Waistband with Inside Draw Cord. 6" Inseam Top Selling Item. WAIST RELAXED 21" 22.5" 24" 26" 28"
They?re awesome for physical education! Excellent fit and nice material.